Automatically feeds and scans originals by page. 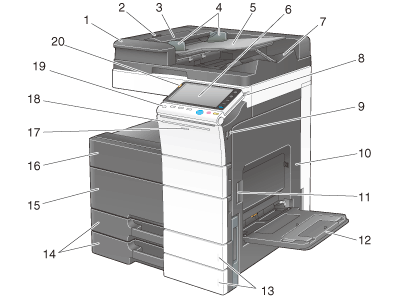 This unit scans a 2-sided original by only requiring the paper be fed into the machine once without reversing. This unit is referred to as ADF in the manual. Used to open the Left Cover. Open the Left Cover when clearing a paper jam. Adjust this guide along the width of the original. Load the original face up in this tray. Open the Original Tray when clearing a paper jam in the ADF. The scanned original is fed out onto this tray. Use this tray to print or copy on irregularly size paper, transparencies, postcards (4 6 (A6 Card)), envelopes, or label sheets. The Bypass Tray can hold up to 150 sheets of plain paper, 20 sheets of Thick 1, 20 sheets of Thick 1+, 20 sheets of Thick 2, 20 sheets of Thick 3, 20 sheets of Thick 4, 20 sheets of transparency, 20 sheets of postcards (4 6 (A6 Card)), label sheets, or index paper, and 10 sheets of envelopes or banner paper. Flashes in orange when a tray runs low on paper, and lights up when a paper-out occurs. Open this door to replace the Waste Toner Box or Imaging Unit, and to clean the Print Head Glass. Open this door to replace a Toner Cartridge. Flashes in blue while this machine is receiving a job. If a job is currently spooled, this indicator lamp lights up blue. Flashes in white during normal printing. Press this key to switch to Power Save mode. When the power is turned off, the machine is placed into the power save mode, and the LED of the Power key lights orange. Indicates the status of this machine by flashing or lighting up. Lights up orange: The machine has stopped. Used to connect Authentication Unit AU-102 or Authentication Unit AU-201. Used to reverse paper when performing 2-sided printing. Used to clean the Electrostatic Charger Wire when an image error occurs. Used to clean the surface of the Print Head Glass when the Drum Unit is being replaced. 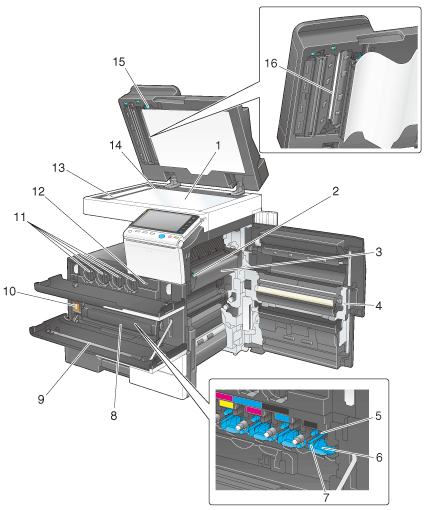 This machine provides Toner Cartridge in four colors: cyan (C), magenta (M), yellow (Y), and black (K). A full-color image is created by combining the four toner colors. Counter the number of printed pages to date. Load the original along this scale. This scale is also used to measure the size of the loaded original. Lever that locks the guide to scan the back side of an original. 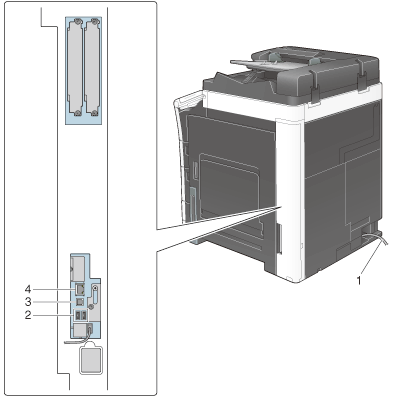 Open this guide when clearing a paper jam or cleaning the Slit Scan Glass (back). Used to scan the back side of an original when using the ADF.